"A thrilling adventure with a fiery, engaging heroine you will not want to take your eyes off for a second " - Ammi-Joan Paquette, author of Rules for Ghosting. Which one is the real monster? Celia Ashleigh, otherwise known as The Fox, is a powerful shapeshifter and spy-in-training, like other firstborns in her family. Remy Broussard's family are werewolves. And the Guardian of La Cluse is on a crusade to wipe out monsters like them. He's kidnapped Remy's little sister and plans to kill her when she changes for the first time on All Hallow's Eve. When Remy begs for help, Celia doesn't hesitate. But the closer she comes to finding the madman and his captive, the more dangerous her task becomes... and the more hopeless. Celia is something more than human, too. Donna Maloy lives on the Texas Gulf Coast. 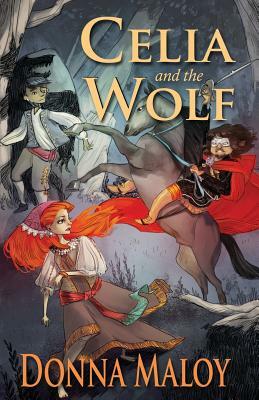 CELIA AND THE WOLF is her first book for teens. She's also written more than twenty-five plays for elementary and middle schools. She loves ethnic foods, shopping, Jeopardy, and geeky things like Google Glass. Her website, donnamaloy.com, and her blog, tangledwords.com, contain resources for new writers, with a focus on contests, workshops, publications and advice from editors and agents. You can also follow Donna on Facebook, twitter, Goodreads, and Pinterest.